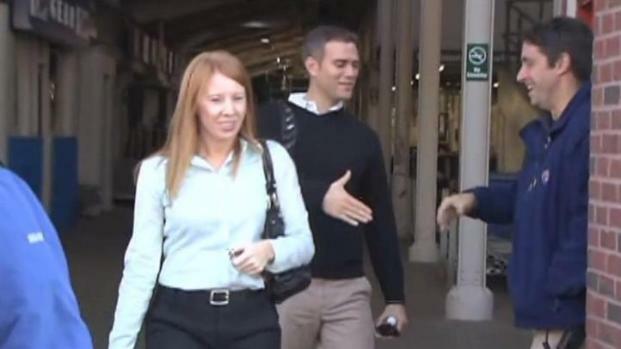 Two days after Theo Epstein officially, finally became the Cubs' president of baseball operations, he was spotted at his new home. Epstein arrived at Wrigley Field Monday to meet team employees, including his new bosses, the Ricketts, according to the Chicago Tribune. A press conference is scheduled for 11 a.m. Tuesday at the United Club to formally introduce Epstein. The Cubs may be reserving the pomp and circumstance for Tuesday. Cameras caught Epstein leaving Wrigley Field Monday with a Cubs employee and climbubg into an older-model white Jetta the employee explained was "a salesman vehicle." Still unresolved is the compensation the Cubs will provide Epstein's old team, the Boston Red Sox, for their former general manager. Commissioner Bud Selig said he would step in if the issue wasn't resolved by Nov. 1. The new Cubs president arrived at the shrine. "Hopefully they can get things done," the commissioner told CSNNE.com. "I always encourage clubs to try to get things done between themselves. Somehow, the commissioner has enough things of controversy [to deal with]. They'll either get it done or they won't. If they don't, then I will." Selig said he wasn't bothered by the movement of executives since the regular season ended. In addition to Epstein leaving the Red Sox, San Diego GM Jed Hoyer will leave the Padres to become the Cubs' general manager.